What is the Auditor role? What is the Auditor Role in XTAM? What access does it provide for users? 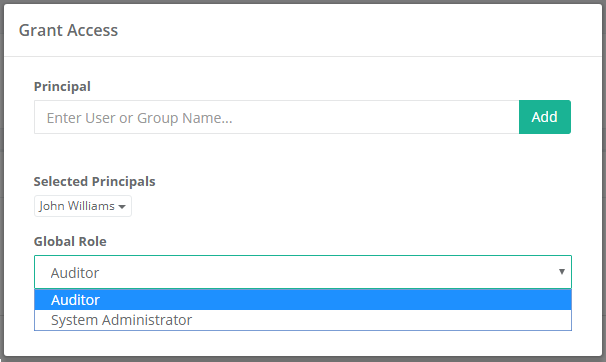 Beginning with the October 2, 2017 release, XTAM now includes an additional Global Role named “Auditor”. This Auditor role allows for a Compliance Officer or Auditor to review and monitor the XTAM system and its records without having direct permissions to each object or exposing secrets and compromising security. Can View all records and folders. This includes Name, Description as well as any other record fields (except secured fields). Can review Record Properties including Type, Created By and Last Modified By parameters. Can access the Audit Log associated to records as well as the XTAM system. Can access the Session History associated to records as well as the XTAM system. Can access the Job History associated to records as well as the XTAM system. Can access the Workflows associated to records as well as the XTAM system. Can access the XTAM system Reports. Cannot “Unlock” or download secrets, passwords, certificates or any other object associated to a secured field. Cannot Connect, Join or Terminate active sessions. Cannot review a record’s Change History. Cannot execute jobs, scripts or password reset tasks. Cannot Create, Edit or Delete a folder or record. Cannot Create, Edit or Delete a workflow, template, binding or grant approval. Cannot modify Formulas, Strategies, Policies or Permissions of a record or folder. Cannot reorganize folders or records using the Cut, Copy or Paste commands. Please note that if a user or group is assigned the Auditor role plus additional permissions to a folder or record, the privileges associated to the folder or record will take precedence over that of the global Auditor role.